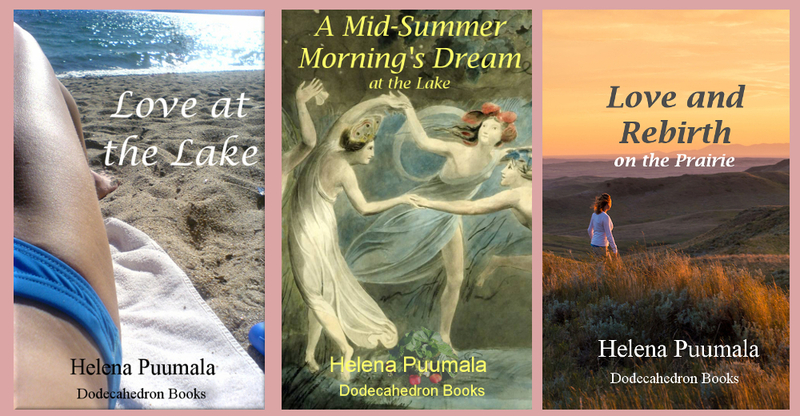 Helena Puumala’s collection of three love stories is free on Amazon Kindle this weekend (November 17 to 21, 2016). Normally, this collection retails at 99 cents (or each story can be purchased separately for the same price). Enjoy some love, lust, betrayal, reconciliation, new romance and family drama, all for free this weekend. Here are three stories, all dealing with the theme of romantic love. They encompass the feelings we all recognize from our experiences of love: lust and desire, jealousy and betrayal, confusion and certainty, forgiveness and reconciliation, loss and rebirth. They even suggest that love might get a little help from those mysterious realms beyond our normal, everyday life. Love is, after all, one of the most magical of all transformations that we mortals can undergo. It should be noted that these three stories have been previously published, but we wanted to bundle them together, for a number of reasons. · Firstly, they are thematically connected - they all concern the joys, pains and triumphs of romantic love. · Secondly, the first two stories are connected by plot and character - Love at the Lake: Part 2 (published separately as “A Mid-Summer Morning’s Dream at the Lake”) tells the story of what happens later to the characters embroiled in the jealousy and betrayal of Love at the Lake: Part 1. Characters can sometimes take on a life of their own, and insist that the writer tell their whole story - that’s just what happened here. Love and Rebirth on the Prairie follows different characters, but they too are searching for love within the complexities of family drama with a history of (possible) betrayal. · And finally, this bundling gives us a way to package the stories in a more economical form for our valued readers - three stories for one low price. In the future, we hope to add even more to this collection of love stories!